With a minor interruption to review our first year full-timing, we pick up our travels back in Moab, Utah. Utah deserves more than a pass-through, so we will be returning in the future to enjoy this rugged, beautiful state. For now, though, it was time to head east. We planned to be in Pittsburgh the beginning of August for doctor appointments and to help with some projects around Lora and J. Michael's new house. Paul can hardly wait to get his hands on his tablesaw again! We've already been to Home Depot and Lowe's in various ports of call for him to reconnoiter what he'll need for some of the projects on the kids' list. From Moab, we drove north to I-70, then started east. We stopped for the night at Rifle Gap State Park in Rifle, CO just at the western edge of the Rockies. Rifle Gap State Park has a newly renovated campground complete with large, level concrete pads and gravel patios. Many sites have beautiful views of the small lake, which is a reservoir for the town of Rifle. The next morning, we started out across the Rockies on I-70. 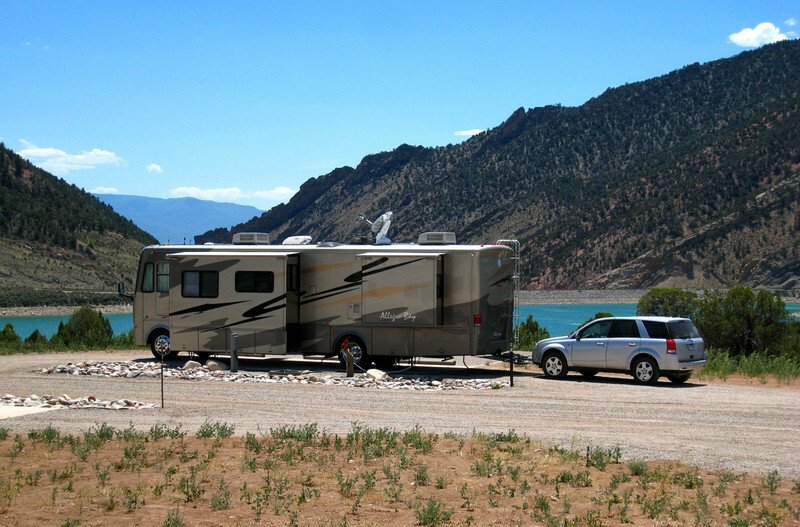 The Rockies were a struggle for our fully-loaded motor home with the Saturn Vue in tow. There were several grades where we were only able to do 20-25 mph. We were, however, able to actually pass two 18-wheelers hauling construction equipment on the slow climb up! From the interstate we could see the major ski resorts - Aspen, Breckenridge, Steamboat Springs, plus some lesser-known resorts. There were many views like the one below that reminded us of Switzerland. After finally making it over the last peak, we descended toward Denver, turned south, and rolled into Colorado Springs, CO where our home for the next week would be Garden of the Gods Campground. We chose Garden of the Gods Campground because of its convenient location even though that would mean we would be closer to the city than we usually like to stay. 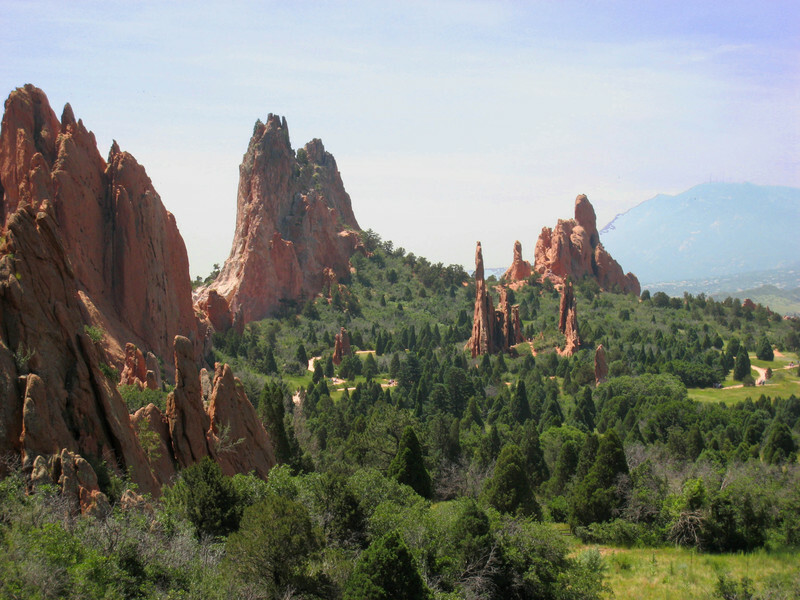 The campground is about 5 minutes from Garden of the Gods. Manitou Springs is about 6 minutes down the road to the right of the campground and historic Colorado City, which is now a quaint shopping district, is a short distance in the opposite direction. Although the campground has many mature trees, the management was very accommodating in giving us one of the few sites that has a clear view of the southern sky for our satellite dish. Unfortunately, our door faced the main road in the campground near the activity center, which resulted in a little more noise than we like from vehicular traffic, people walking to and from the activity center and the pool, kids on bikes yelling to their friends, and from the activity center itself. This is why we usually don't go to campgrounds with a lot of planned activities; but if you are one of the many who likes the campground to provide things to do, this is the place for you. They have something every night during the summer including a barbecue dinner, an ice cream social, and live entertainment twice a week. Some of the sites (including ours) were a little close to the neighbors and some (including ours) had back to back hookups. The cost was over $39 a night at the weekly rate (including tax, but excluding the extra charge for Wi-Fi). ...but in reality they are thin slabs. Horizontal, sedimentary layers here at the edge of the Rockies were pushed upward during the formation of the mountains. As the surrounding layers were eroded away, harder layers of previously horizontal rock were left standing vertically and at crazy angles. 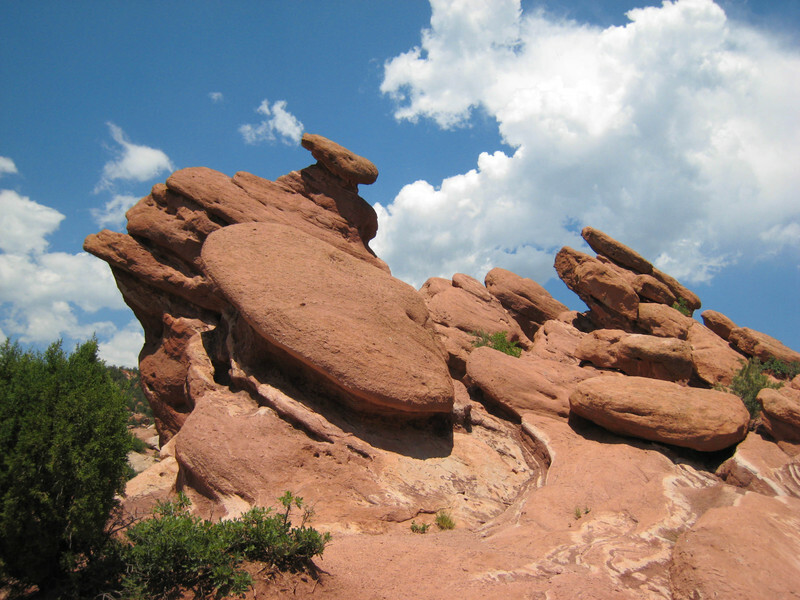 The photo below shows smaller rocks leaning at a precarious angle. For more photos and information about Garden of the Gods, please see Photo Album 022: Colorado Springs and Points East. 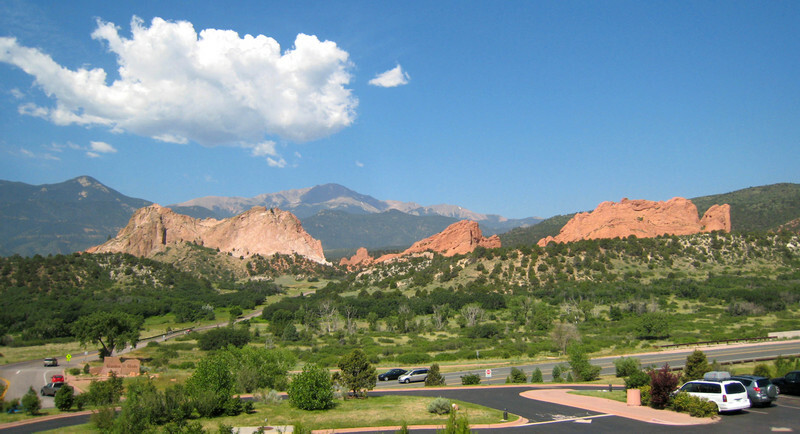 In the photo of Garden of the Gods from the visitor center above, you can see Pikes Peak in the background. 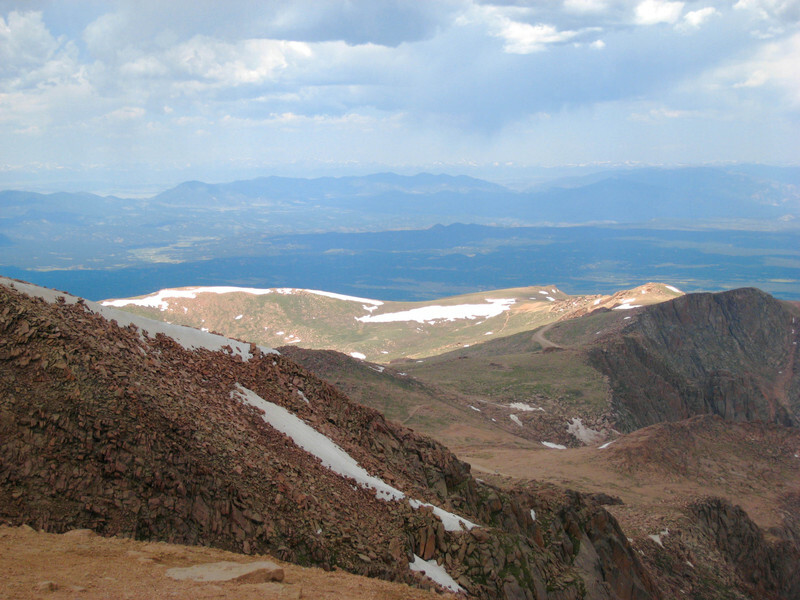 Pikes Peak was named for Lt. Zebulon Pike, who was sent to explore the Louisiana Purchase in 1806. Lt. Pike and his party attempted to scale the mountain in Nov., 1806, but were turned back by waist-deep snow. Colorado has 54 mountains that exceed 14,000 ft. At a height above sea level of 14,110 ft., Pikes Peak is only number 31 of these 54 mountains. Why then is it so famous? It is so well known because of its location. 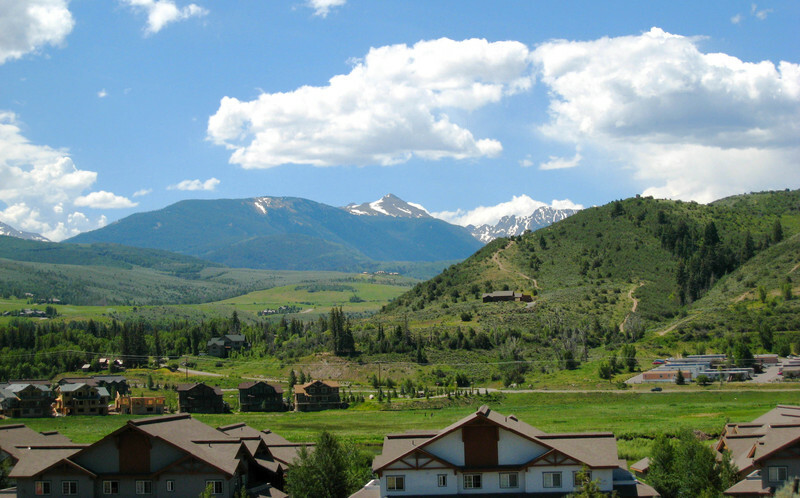 It is on the front range of the Rockies and can be seen from a great distance. It reportedly could be seen by early settlers as they crossed Kansas. 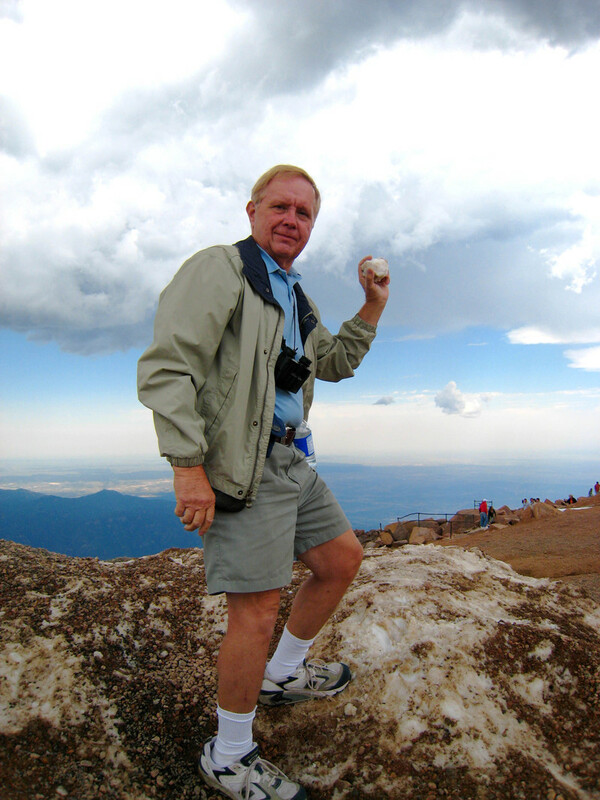 There are three ways to get to the top of Pikes Peak - you can hike (not an option for us), you can drive (19 miles one-way starting in the nearby town of Cascade), or you can take the Manatou and Pikes Peak Cog Railway. We chose the railway. In 1883, James Kerr proposed an aerial tram as a better way than the existing roads and trails for visitors to reach the summit to enjoy the spectacular views. When that proposal ran into problems, Kerr began planning a narrow-gauge railway. When Kerr lost all the money set aside for the railway in a bank failure, one of his investors organized his own company and began plans for a cog railway. 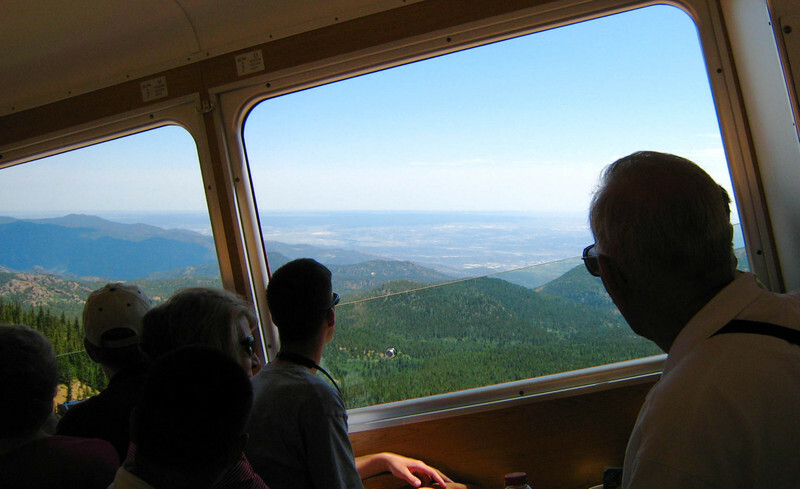 The cog railway was designed by a Swiss engineer and is 8.9 miles long. In several places, it has grades of 25% (25 ft. of rise for every 100 ft. of forward travel). A standard railway usually has grades of no more than 2% and highways usually don't exceed 8 or 9%. In the view below, the camera is straight. It's the train that is climbing at such a steep angle. Construction of the railway was started in April, 1889. Trains began trips to Half-Way House in August, 1890 and the first passenger train reached the summit on June 30, 1891. The early trains consisted of passenger coaches pushed by small, cog-driven steam locomotives built by the Baldwin Locomotive Works in Philadelphia. The railway currently uses Swiss-built, self-propelled, streamlined passenger rail cars. 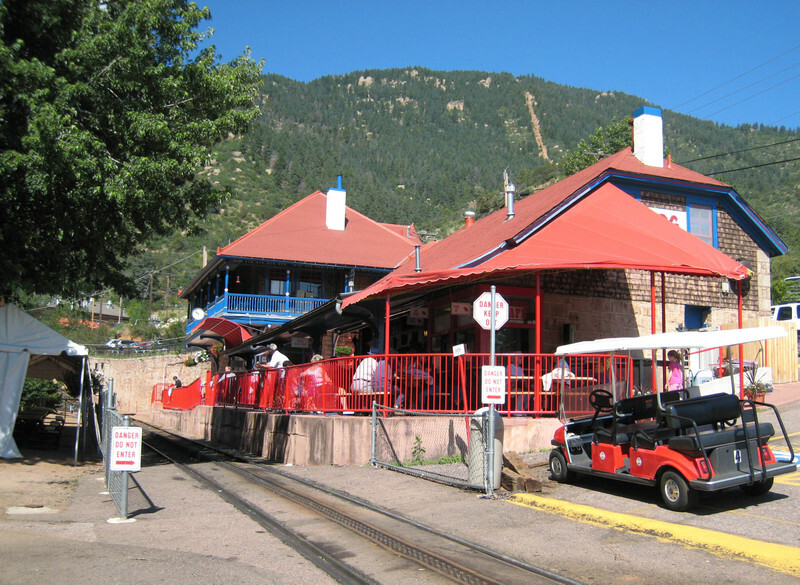 The rail trip to the top of Pikes Peak begins in Manitou Springs, which is named for its mineral springs. Today, the town is a quaint tourist town with Victorian buildings containing shops and cafes lining the main street. The train depot, shown in the photo below, is off the main street at the base of the mountain. You can see the cogs between the rails in the foreground. At several places on the way up the mountain and especially at the summit, the views are spectacular. In 1893, Katherine Lee Bates made the trip up Pikes Peak by wagon. She was so inspired by the view, she wrote a poem to capture what she saw. Her poem, America the Beautiful, was later set to music and was once considered as a candidate for the National Anthem. ...and Margery sat and relaxed during one of the brief sunny periods. There are more photos of our train ride up Pikes Peak in Photo Album 022: Colorado Springs and Points East. Although classes were not in session and the campus was quiet, it was so interesting to visit the U.S. Air Force Academy located just north of Colorado Springs. There was a very informative movie about Academy life presented in the visitors' center. The exhibit area featured displays regarding Academy history and cadet life as well as the four areas of cadet training: character development, academic, athletic, and military training. We were disappointed to learn that we arrived too late to attend church services in the uniquely-designed Air Force chapel. There is a Protestant and a Catholic service each Sunday even when cadets are not on campus. The Class of 2011 had arrived the weekend before and were off campus attending their five-week Basic Cadet Training. Our daughter's college roommate dated an Air Force cadet throughout their college years and married after graduation. Margery especially enjoyed learning about life at the Air Force Academy that prepares young men and women to "lead the United States Air Force in service to our nation." Colorado Springs is also the home of Focus on the Family. Focus on the Family was founded by Dr. James Dobson and is committed to a Christian-based, common-sense approach to helping families thrive. From a simple beginning including a book on child discipline and a 25-minute weekly radio broadcast, Focus on the Family has grown over the years. Lora was just 4 years old when Margery began listening to Dr. Dobson's daily radio program and in many ways is a product of all that Margery learned about parenting, discipline, child development, and relationships. Today, the ministry addresses such things as life transitions, spiritual development for all ages, social issues which impact the family, and provides wholesome entertainment with life lessons for children. The Focus on the Family Welcome Center details the growth of the ministry and includes an art gallery of G. Harvey original paintings which are used for the Focus Christmas cards, and an extensive bookstore including a great collection of greeting cards. There was also a tribute to Dr. Dobson's father who was a Nazarene pastor. We were surprised to learn he was a graduate of the Art Institute of Pittsburgh before he went into ministry. From Colorado Springs, we headed east for a one-night stop near Colby, KS at High Plains Camping. 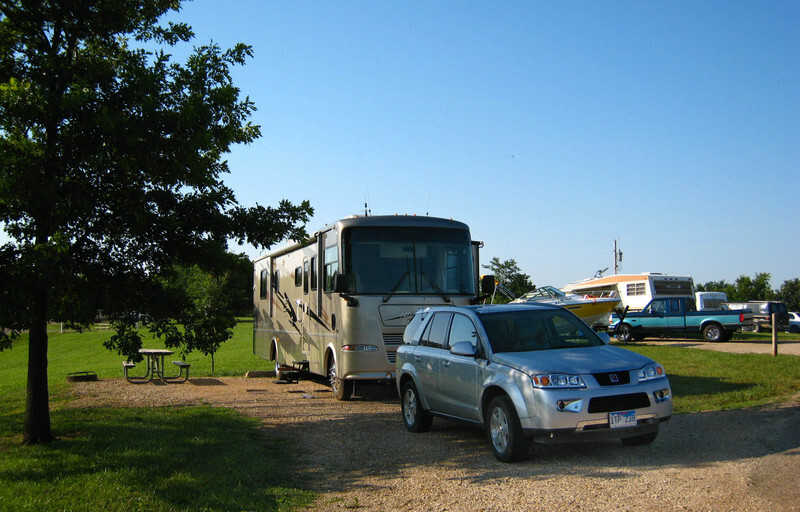 The campground has mostly pull-throughs, gravel roads and pads, and has side-by-side hookups. Fortunately, the campground wasn't full and they spaced the RVs out with at least one empty site between. High Plains Camping is convenient to the interstate, but highway noise isn't bad. It is fine for a one-night stop. The next morning we left for Minooka Corps of Engineers Campground at Wilson Lake near Dorrance, KS. After about 6 weeks of fairly busy sightseeing, we were looking forward to staying here a few days with no real sightseeing and slowing the pace a little. 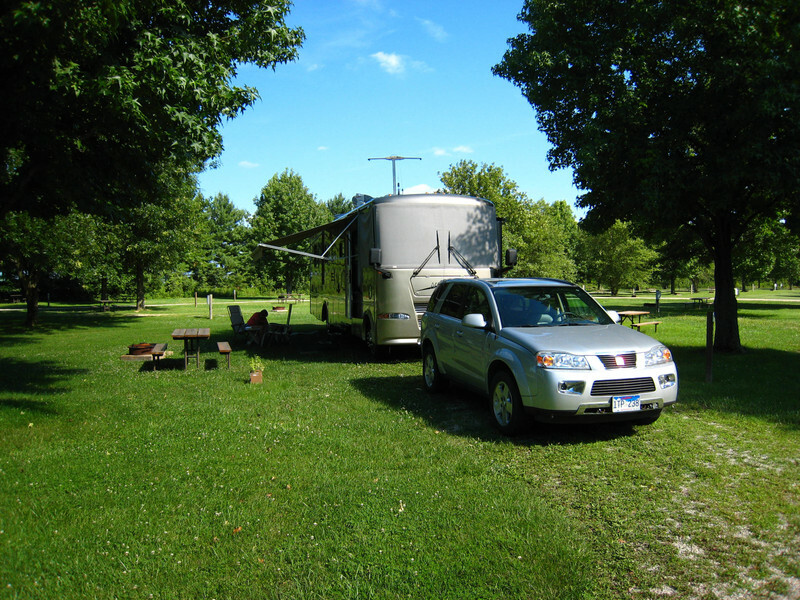 Minooka Campground has huge sites with extra long pull-throughs and extra wide back-ins, many with a nice lake view. There are paved roads, gravel pads, grass, and a few trees. We stayed on "A" Loop, which was the farthest from the boat launch and swimming area. Therefore, it wasn't quite as overcrowded on the weekend. This area of Kansas, known as Smokey Hills, is still in the shadows of the Rockies and gets little rainfall. For that reason, the trees are small and not very plentiful. The grass is prairie grass and the area is good for grazing cattle. Having few trees, early settlers ingeniously solved their fencing problem by quarrying local limestone to use as fence posts. They discovered a layer of limestone of a rather uniform thickness of 8 to 9 inches thick near the surface. This limestone is relatively easy to cut and shape when it is freshly quarried, but hardens somewhat and becomes more weather resistant after being exposed to the air for a time. The limestone was also used for many buildings. The limestone is commonly referred to as post rock and this area of Kansas is also known as Post Rock Country. 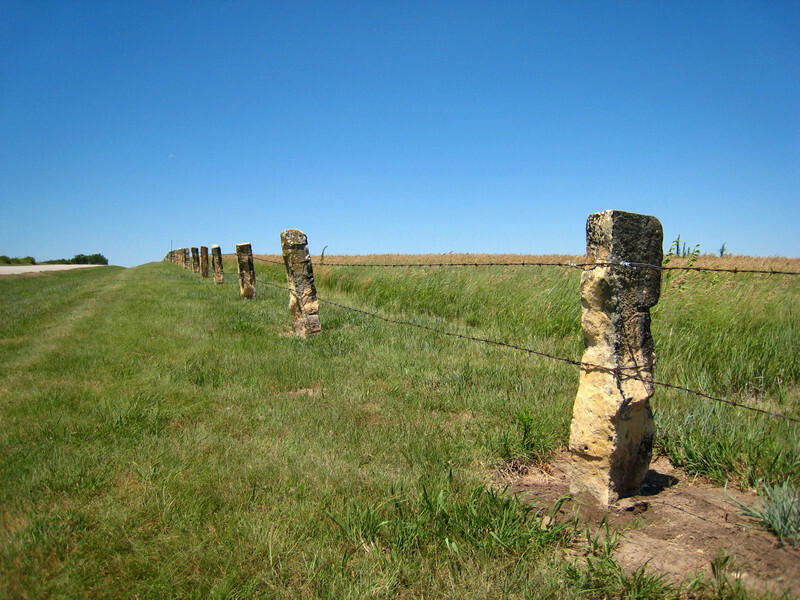 The photo below shows typical stone fence posts. 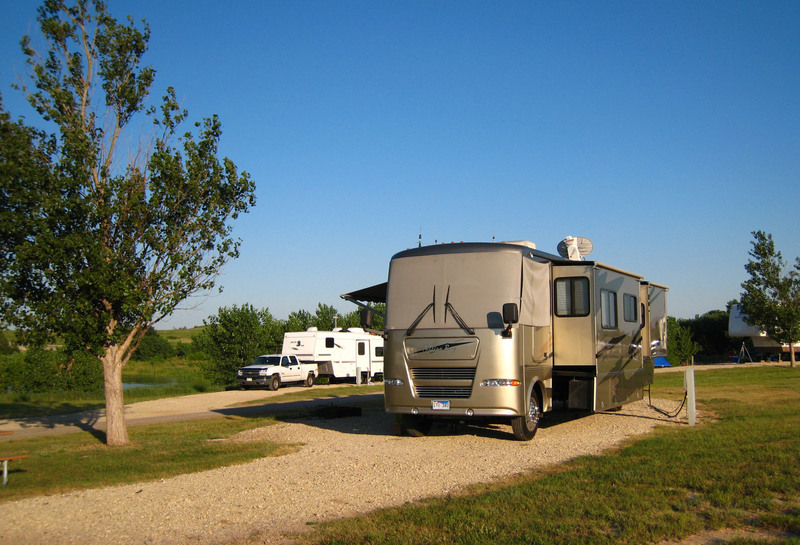 Following a relaxing several-day stay at Minooka Campground, we moved farther east to Slough Creek Corps of Engineers Campground at Perry Lake near Perry, KS. Slough Creek has large back-in sites with plenty of grass and a few trees. Roads are paved and the sites are gravel. The campground was relatively quiet when we arrived on Tuesday; but as can be expected on the weekend, it got very crowded. Posted rules sometimes set us up for disappointment since they are often not enforced. There were a lot of dogs running loose and lots of vehicles and boats parked on the grass between sites in spite of the fact that these things were prohibited. Quiet hours are also often a misnomer. Our neighbors carried on around their campfire with loud conversation, laughter, and a radio until 3:00 a.m. People just have no idea how sound travels. We have found many people camp to party rather than to enjoy the beauty and quiet of nature with bird songs as the only background noise. We are grateful that we can now enjoy these things during the week. Slough Creek was also the site of our first experience with the emergence of millions of midges. There are numerous types of midges, but these were aquatic midges which don't bite. Unlike the small, black gnats that try to fly into your eyes and buzz in your ear, these midges just fly in swarms in huge numbers. They do get into your face, but probably more because there are so many of them rather than by intent. We had seen a few groups of them flying around under our awning on a couple of evenings; but we awoke one morning to thousands of them on the underside of the awning, on the side of the motor home, and swarming around the windows and doors. We couldn't get in or out of the motor home without at least a half a dozen midges finding their way in through the door. When you walked through the grass, clouds of them rose up. The next morning, the midges were largely gone. They either moved on or died off. What a relief! Our next stop was Ray Behrens Corps of Engineers Campground at Mark Twain Lake. 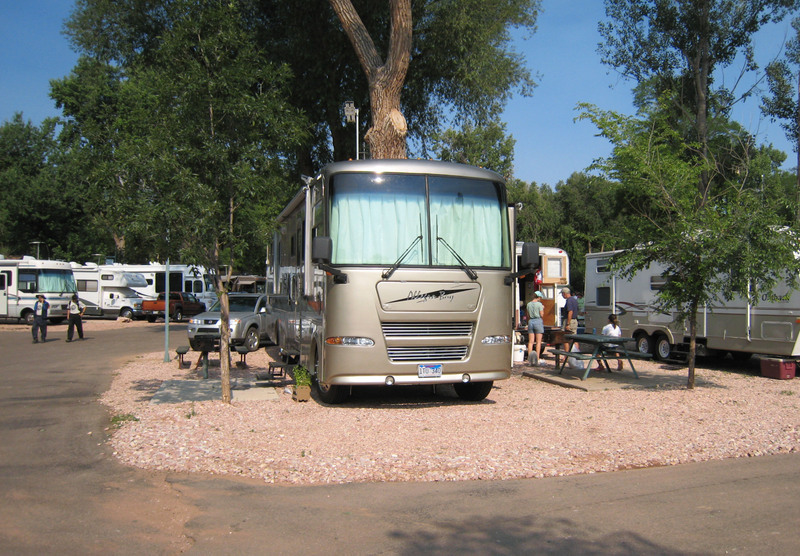 Ray Behrens Campground has enormous sites, some with full hookups. The sites range from open grass with some trees to heavily wooded. They also have a good number of non-reservable sites, which makes it easier to make a last-minute stop. Mark Twain Lake is about a half hour from Hannibal, MO, which is the home of Samuel Clemens who is best known by his pen name Mark Twain. While in Hannibal we took a ride on the Mark Twain Riverboat, which is 120' long, diesel-powered, 1964 reproduction of an 1800s stern wheeler. Although only an hour long, the cruise narrative is loaded with interesting information about Samuel Clemens, Hannibal, and the Mississippi River. As an added bonus, the stern wheeler Delta Queen was in port. 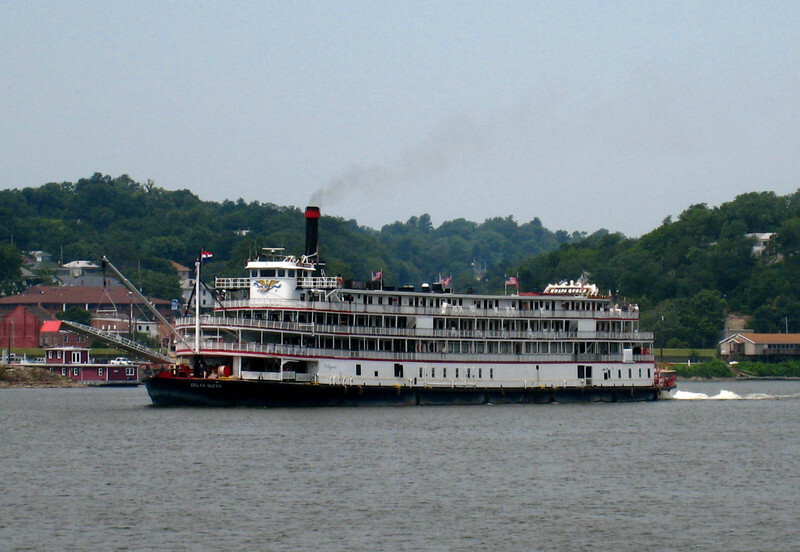 As we were returning to our dock, we got to see the Delta Queen (shown in the photo below) depart for St. Louis, and we got to hear her caliope play as she headed downstream. Hannibal is also the birthplace of Molly Brown of Titanic fame. Although the "unsinkable" Molly Brown had planned to return to Hannibal to visit her sister in the spring of 1912, the sudden illness of a grandchild caused her to to book passage at the last minute on the Titantic. 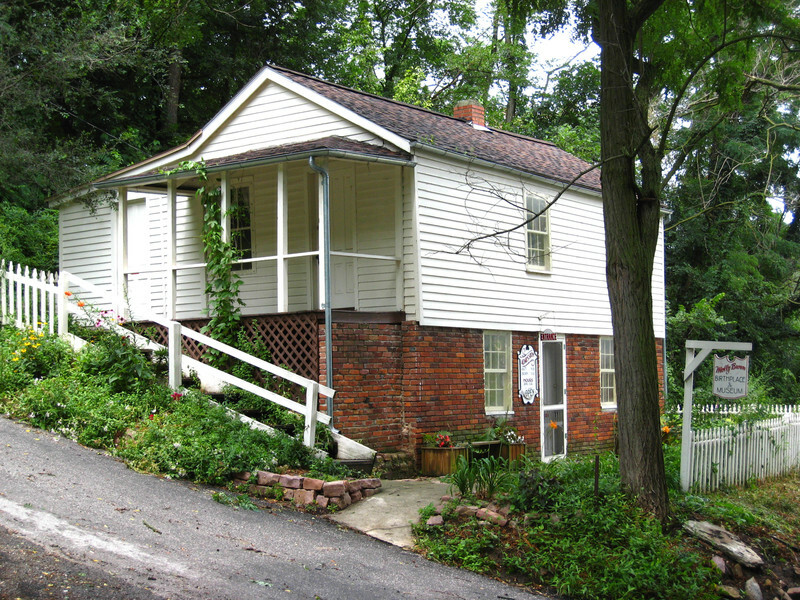 The photo below shows the home as it exists today as a museum. Check out Photo Album 022: Colorado Springs and Points East for more photos and information on Mark Twain and Hannibal, MO. From Mark Twain Lake, we continued eastward to Lincoln Trail State Park in Marshall, IL. We had stayed at this campground on our way west last year, and we really liked it. Lincoln Trail State Park is located near the end of the 1,000-mile trail that Abraham Lincoln and his family traveled when they moved from Kentucky to Illinois in his early childhood. The park has two camping areas - Lakeside and Plainview. We stayed in Plainview, which has grassy sites with a fair amount of shade. Lakeside has HEAVILY wooded sites. All sites are large with gravel pads. There are a few fully-paved handicapped sites in both areas. Lincoln Trail does not accept reservations. All sites are on a first-come basis only. The campground was not full, even on the weekend, and it was nice and quiet. The temperatures moderated, and we got out our bikes and were able to ride them every day. We also got to sit out and read every day and got to enjoy several campfires. Now, that's the kind of relaxation we've been looking for! On Saturday we went to Terre Haute, IN, to a farmers market and got our first sweet corn in almost two years. Although it had been picked the night before and had been sitting in the sun, it was pretty good. I guess some might call us "corn snobs." If we could take the Coleman stove out to the field and bend the corn on stalk right into the water, we'd say, "Now that's GREAT corn!" After several days, we moved east again to Caesar Creek State Park near Waynesville, OH. This has always been one of our favorite destinations. Being near Cincinnati and Dayton, Caesar Creek definitely fills up on weekends; but during the week, it is usually peaceful. The sites are very wide with plenty of grass and a few trees for shade. They raised their prices this year to $25 a night ($27 on holiday weekends), which is a little high for 30 amp electric and no water or sewer hookups. However, they accept Passport America for 50% off Sunday through Wednesday. Our plans to stay here 8 days included taking Molly to a canine internist to try to get a definitive diagnosis and recommended treatment for her suspected health problem. 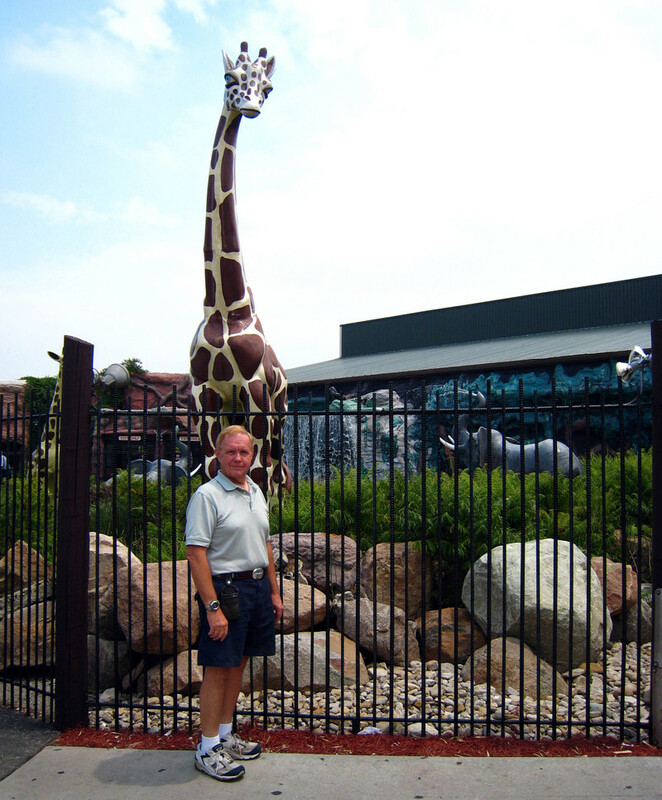 We met with Dr. Lee Schrader of Suburban Veterinary Clinic. It was wonderful to meet with a specialist who could cut through all the rhetoric. After consultation, examination and an additional test, Dr. Schrader concluded that, although there may indeed be a problem, there are few if any symptoms and no treatment is recommended unless and until symptoms get to be a problem for either us or Molly. Molly, who is 13, is actually doing quite well for her age. During the visit, the vet did uncover a latent bladder infection. Molly had problems with several previous infections and it had apparently gone "underground." It was still there, but it was not active. The infection will require extended treatment with antibiotics and a follow-up test in about a month. 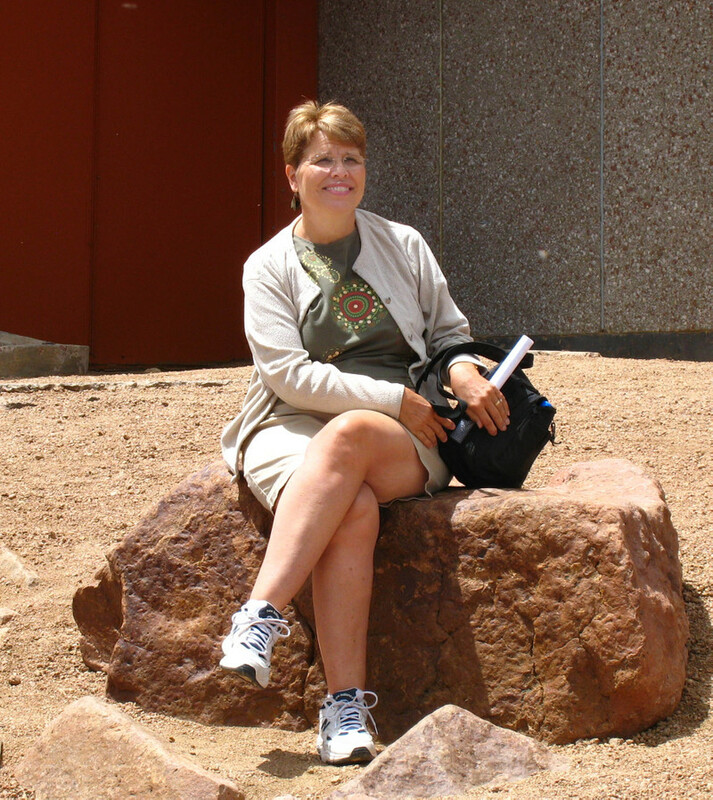 We are so very pleased with Dr. Schrader...her kindness, thoroughness, and practicality. Since we'll be here again over Labor Day weekend with Lora and J. Michael, we've scheduled Molly's follow-up test for early September. We must say that almost every vet we saw across the country (11 over the past year) had identified a piece of the puzzle, but we can't say enough about seeking out a specialist when there's something going on internally. We even get to take Molly off the $45/bag dog food! She is happy to return to her standard Purina Senior. No more coaxing by covering the other dog food with broth! Waynesville, OH is about 20 minutes away from Caesar Creek. Waynesville bills itself as the antiques capital of the midwest and antique shops line the main street. Waynesville is also the home of Der Dutchman, which is one of our favorite restaurants. They have four restaurants in Ohio and one in Indiana. Their breakfast buffet can't be beat and their Manhattans (hot roast beef, pork or turkey sandwich) with REAL mashed potatoes are exceptional, too. Right at the exit 45 on I-71 is Caesar Creek Flea Market. 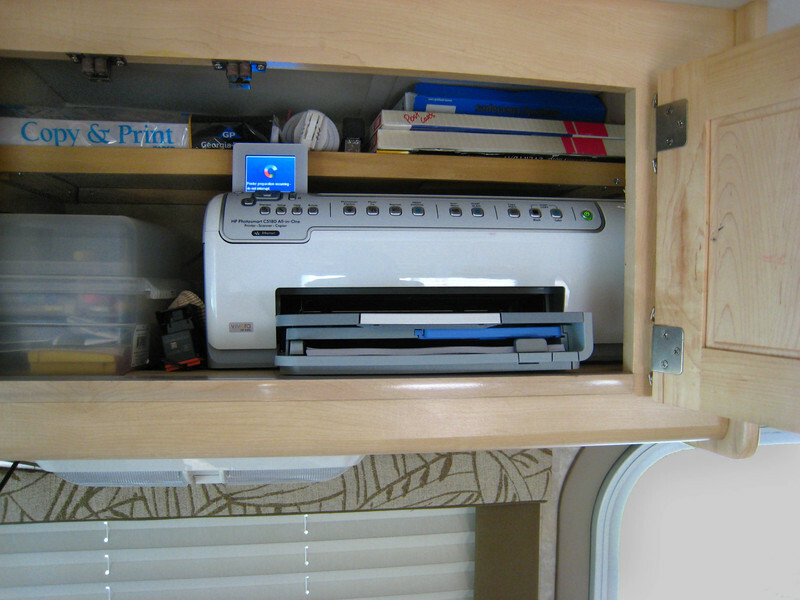 There is a nice mix of new and used merchandise here and, even though we don't really need to do much shopping now that we are full-time RVers, we still enjoy looking. The Cincinnati/Dayton area also has several other flea markets, but since they are a little farther away, we skipped them for this trip. We took one day to travel to the other side of Cincinnati to visit Jungle Jim's International Market. Here's a picture of Paul at the entrance. Not only does it have American groceries, but products from the countries "across the pond" as well as Asian countries and India. From this picture, you can also see just some of the variety of produce that is shipped in from around the world. 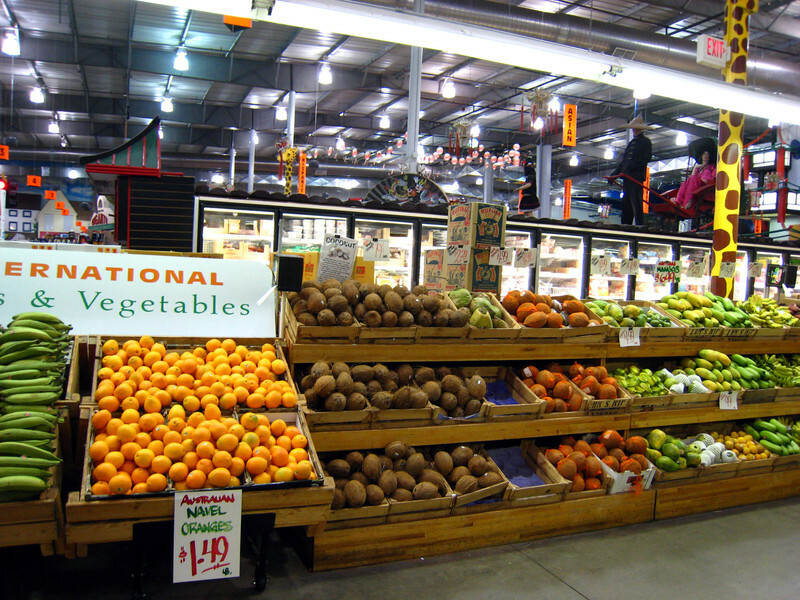 There are oranges from Australia, mangos from Haiti, several types of coconuts, and numerous varieties of bananas and melons from various locations. At one point we said, "If they don't have it, it must not be made." However, they did NOT have Paul's favorite candy, ju-ju fish. This all-inclusive grocery store had more kinds of butter that you can imagine....from all over the world. It's the same for many other items. 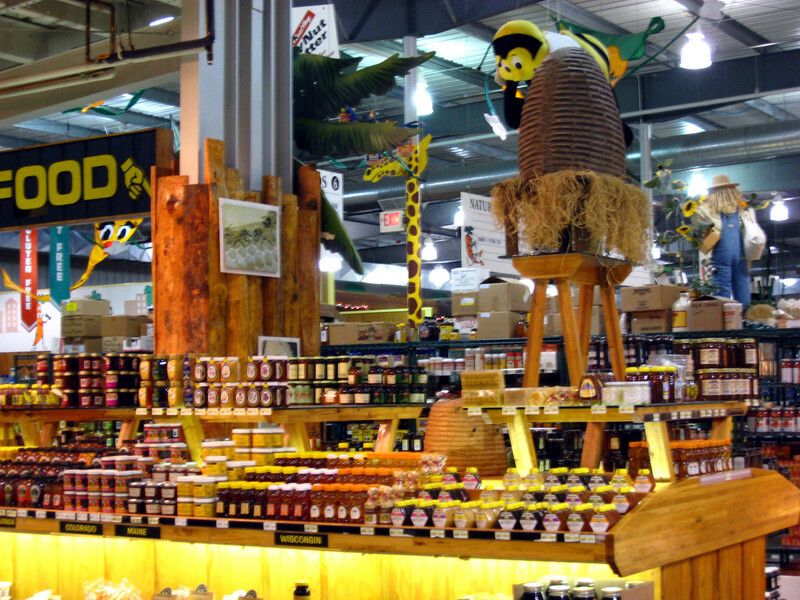 From this picture you can see the honey display. In addition to all of the interesting displays and foods, the Jungle Jim bathrooms are one of five finalists in the America's best bathroom contest. We have to admit, we did hesitate before opening the door. 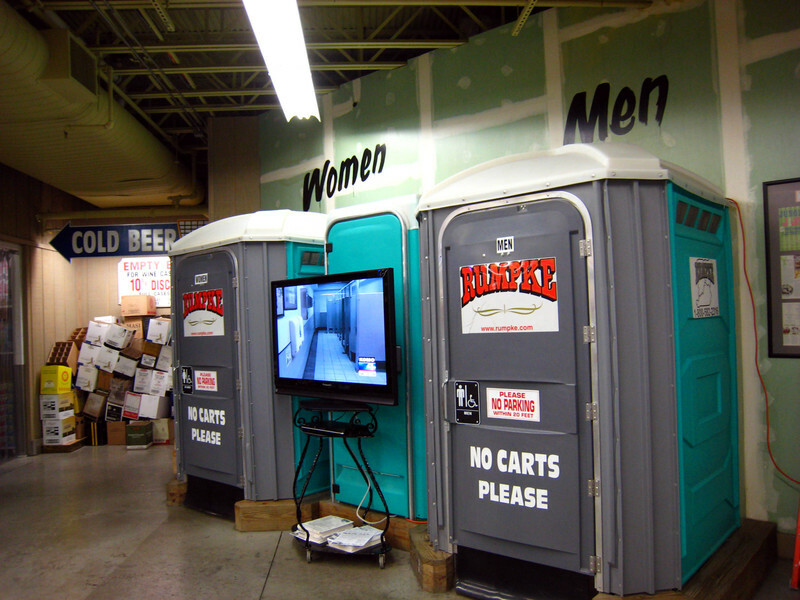 :) The Porta-Potties are just a front and the restrooms inside are actually quite nice. From Caesar Creek, it's on to Pittsburgh. With less sightseeing, the posts will probably be a little less frequent for the next several weeks. We are looking forward to spending time with family and working on some projects.